Throughout the 2018 Monster Energy NASCAR Cup Series, the “Big Three” of Kevin Harvick, Kyle Busch and Martin Truex Jr. have held down the top-three spots in the AutoRacingDaily.com power rankings, and this week is not different. Also, the trend of Harvick and Busch in the top-two spots continues. 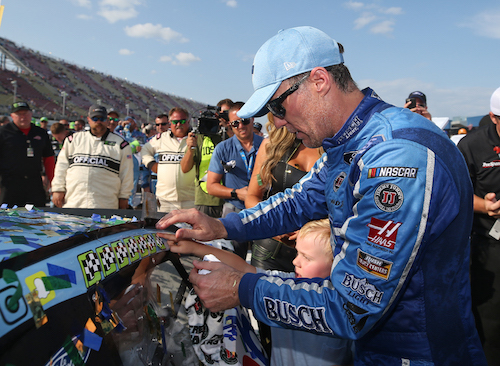 With his series-leading seventh race win and 11th and 12th stage wins of the season Aug. 12 at Michigan International Speedway in Brooklyn, Harvick retook the top spot from his closest competitor, Busch. Meanwhile, Busch, with his six race wins and a third-place finish at MIS, Busch drops only one spot from our last power rankings to second. Truex finished outside the top-10, in 14th, at Michigan, but he maintains the distant third position behind the series’ two leaders on the strength of his four race wins. Aside from Harvick and Busch, Truex is the only other driver with more than two wins. He and Clint Bowyer are the only other two drivers with multiple wins. Bowyer is fourth in the power rankings. As previously mentioned, he’s the only other multi-race winner outside of the “Big Three.” With the five playoff points from those two wins, he’s the only driver not among the “Big Three” to have double digits in playoff points with 10.